Hollow Metal Doors & Frames. Wood Doors. Commercial Door Hardware. Company & Industry news as well as updates to this site as they occur. Please check back often as this is regularly updated. Door closers are required on fire rated doors so that the door will close after somebody has passed through it. The door can then retard the fire as it was meant to. However, closers are used on many other non rated doors especially with the handicap code. Almost all closers will have a sweep and latch speed adjustment. The sweep is the movement of the door from the open position to just before it latches into the frame. The latch is those last few inches just before the door actually reaches the latch. You can adjust the speed of either one of these to obtain the results you require. Sometimes you will need the door to close quickly (not on handicapped doors) and then slow down right before closing to avoid slamming. Other times you will need the door to close slowly and then speed up at the very end to ensure that it actually latches. The backcheck control will let the door open at the normal speed to almost 90 degrees and then slow the door down for the rest of the opening cycle so that the door doesn't swing open out of control allowing someone in a wheelchair, for example, to have time to get through the opening. Some closers are available with the hold open arm feature. This closer will let the door automatically stay open when it is opened to a certain point. All you have to do is pull the door a little to make it close normally. If the door is opened to less than the hold open point, it will close as if it did not have a hold open arm. The hold open arm can not be used on a fire rated opening. Delayed action closers will hold the door open for a certain amount of time before it starts to close as a normal door would. 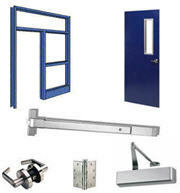 A social media area dedicated to commercial doors, frames, and hardware. Ask a question, provide an answer, or just browse the posts!